is limited to stock availability. CZone Digital Switching, Control and Monitoring - LightHouse 3.8 now supports CZone digital switching, monitoring and control. System integrators and boat builders can now customize the LightHouse dashboard app with rich graphics for CZone. 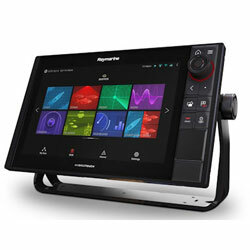 JL Audio Media Master Remote Control - Control JL Audio marine source units from the LightHouse 3.8 audio app. Compatible with the JL Audio MM50, MM100 source units and MM40R remote using NMEA2000. Search and Rescue Patterns - LightHouse 3.8 now features Search and Rescue (SAR) pattern support. First responders and good Samaritans can automatically generate sector, creeping Line or Parallel Line search patterns to assist in locating persons and property in the water. Collision Avoidance Predicted Area of Danger Overlay - Predicted Areas of Danger overlay shows you precisely where the risk of collision is highest when maneuvering through marine traffic. Using AIS data or MARPA tracking, risk areas are highlighted in in red right on your navigation chart. Dynamic Target Intercept Calculations - Target Intercept shows the quickest way to rendezvous with another vessel using AIS or MARPA. Select a target, choose Intercept, and LightHouse will show you the course to steer on the chart. Electronic Chart Synchronization - Chart synchronization allows you to synchronize the heading, range, and position information across multiple chart views and networked displays. LightHouse NC2 Electronic Chart Base Map - 3.8 introduces a new LightHouse Chart base map with improved small-scale detail, chart labels, and geographic boundaries. LightHouse Charts Selectable Depth Coloring - Raymarine LightHouse vector charts can now show variations in water depth using several shades of blue and white. LORAN-C TD Support - LightHouse 3.8 now supports Loran C TD position displays and waypoint entry via loran TDs. LightHouse Apps Manager (Axiom family exclusive) - The LightHouse Apps manager now allows users to customize and add new Raymarine approved LightHouse Apps. Look for new LightHouse Apps to be released throughout 2019.